In honor of NaNoWriMo, I thought we could talk about books and novels. Specifically, knitting in books and novels. Sometimes it’s a sneaky, subtle part of a book, and sometimes it seems like it’s almost a main character. I don’t know about you, but whenever I come across a mention of knitting in a book, I always get excited, as if I just saw an old friend make a cameo. So, without much more ado, let’s jump right in to my favorite book series of all time. Harry Potter (obviously)! Knitting isn’t a big part of these books, but it peeks its wooly head up more than a few times. And, even Professor Dumbledore, while not a knitter himself, is a big fan of the art. More than once, he mentions his love of warm woolen socks, and once he reads a muggle knitting magazine while waiting for a couple other characters to finish a conversation. Clearly, I have read (and re-read) the Harry Potter books a few too many times, but, you know what? I don’t care! They’re fun, interesting, well-written, clever, and have lots and lots of knitting in them. What’s your favorite knitting-related book? 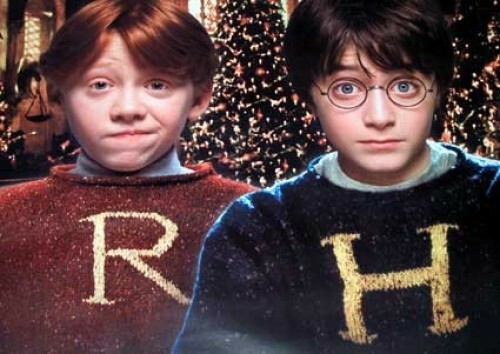 This entry was posted in FYI and tagged books, Harry Potter, knitting, knitting in harry potter, literature, mrs weasley, novel, Weasley Sweater on November 5, 2014 by onemilljellybeans.